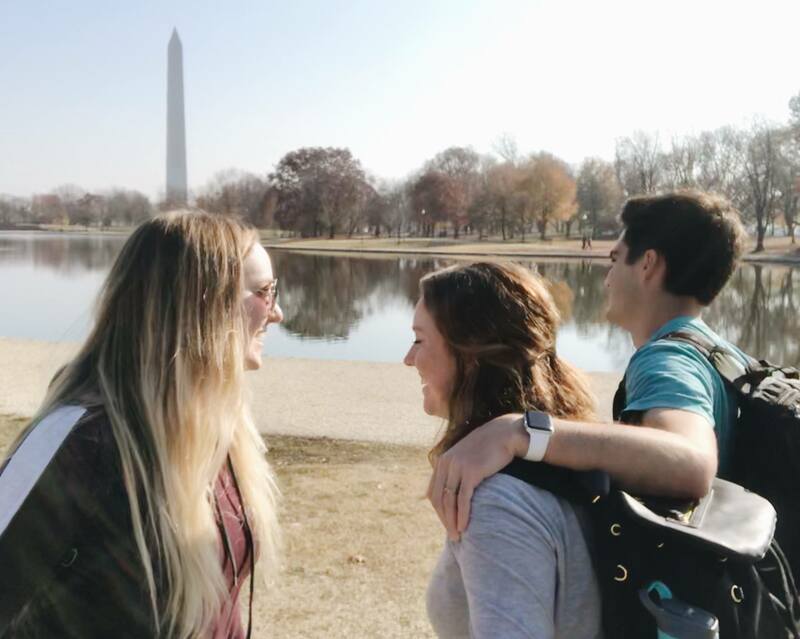 We Spontaneously Spent 19 Hours in Washington D.C. If anyone follows me on Instagram, you saw that Mason and I went to Washington D.C. last weekend! It was completely last minute, and it could not have been more fun! On Saturday, I passively told Mason that it would be fun to see the White House during Christmas. I had seen pictures online, and I love how each first lady does their own style of Christmas decorations. Say what you will about the Trumps, but this first lady and her team know how to decorate a tree. Holy cow the pictures have been stunning! Mason immediately started looking for cheap tickets and found some out of Las Vegas that night. An hour later we had a friend on board, our backpacks packed, then hit the road! After a 5.5 hour drive and a 4.5 hour flight, we landed at 4:30am in D.C.! 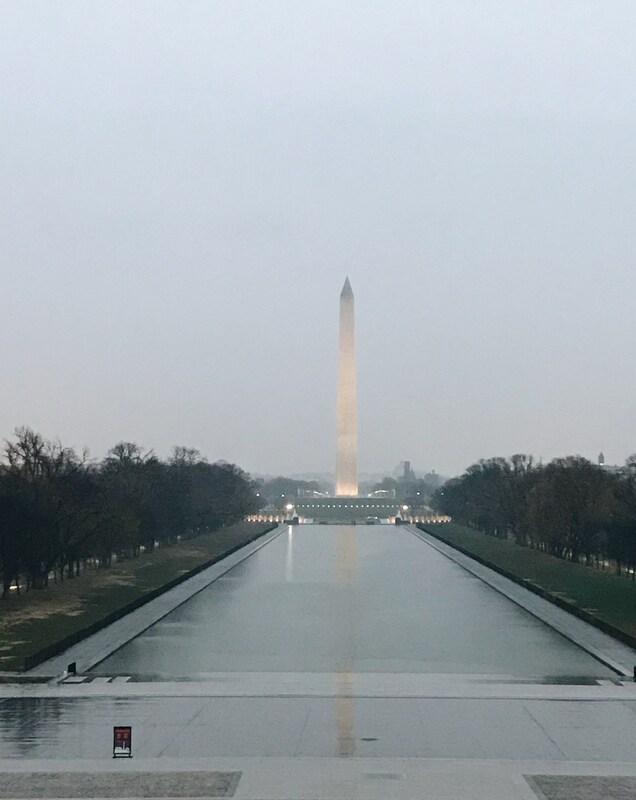 The National Mall that early in the morning is amazing. We were the only ones there with the exception of a couple security guards and a few joggers. It was stunning! We weren’t fighting for a view of the memorials, and we were not avoiding bikes the entire time we were there. It was quiet and peaceful (lol until we got there). We started at the Capital and walked toward the Washington Monument. I love seeing state capitol buildings, but none of them compare to the Capitol Hill in D.C. It is a truly magnificent building. Around the Washington Monument, we started getting rained on. We obviously we did not plan on getting rained on because we did not really plan on the trip… We booked it to the Lincoln Memorial and waited out the rain until we could grab breakfast (because nothing is open at 6am on a Sunday, go figure! (insert stumped emoji)). It was pretty cool. 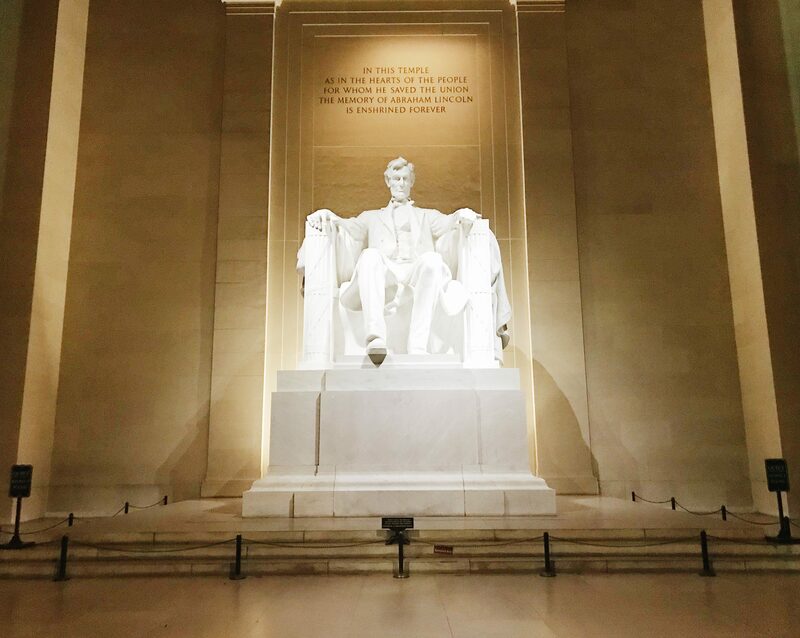 There were a few others waiting out the rain, but again, I got some picture of Lincoln without people in it. That would not have been possible 3 hours later! We went to breakfast at Ted’s Bulletin. On yelp, a lot of people recommended getting the tarts, and they were not wrong! We got the salted caramel and the blueberry cheesecake tarts. Kas and I liked the salted caramel better, but Mason like the blueberry cheesecake better. The rest of breakfast was yummy, but those tarts were worth the trip alone. After breakfast, Ubered to the Arlington Cemetery. I am convinced that the time to visit the city is in the morning before everyone else is awake. Arlington is an inherently reverent place, but at 9 in the morning, it was absolutely beautiful. We had the place almost completely to ourselves. I have been to the Tomb of the Unknown Soldier three times now, and this third time was completely empty. There was a photographer there for about 2 minutes, but he got his shot and left. This was the first time that I got to see the Kennedy burial site. It was really hard to find! Maybe we were just loopy, but we felt like it was pretty hidden. After Arlington, we walked to the White House (because that was the point of the trip). I loved the wreaths on the outside! The White House is closed on Sundays, and even if it was open, it takes a long time to get tickets to go inside, so we did not get to see the inside. But the outside was so fun and decorative and pretty! The next stop was the Smithsonian. The Air and Space Museum was Mason’s jam! He loved looking at all the planes, and he especially loved the model of the aircraft carrier. He was so impressed that the model was a 1/100 scale. The model seemed really big, but thinking of 99 more was almost unfathomable! Aircraft carriers are huge!!! Our favorite museum throughout the day though, was the Holocaust Museum. 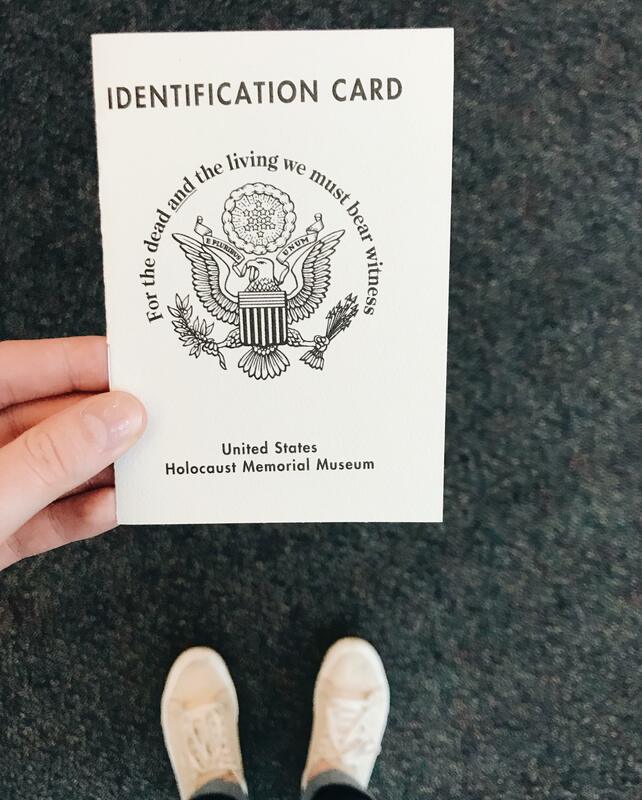 When you go into the exhibit, they start by having you pick up an identification card that outlines the life story of someone who lived during the Holocaust. 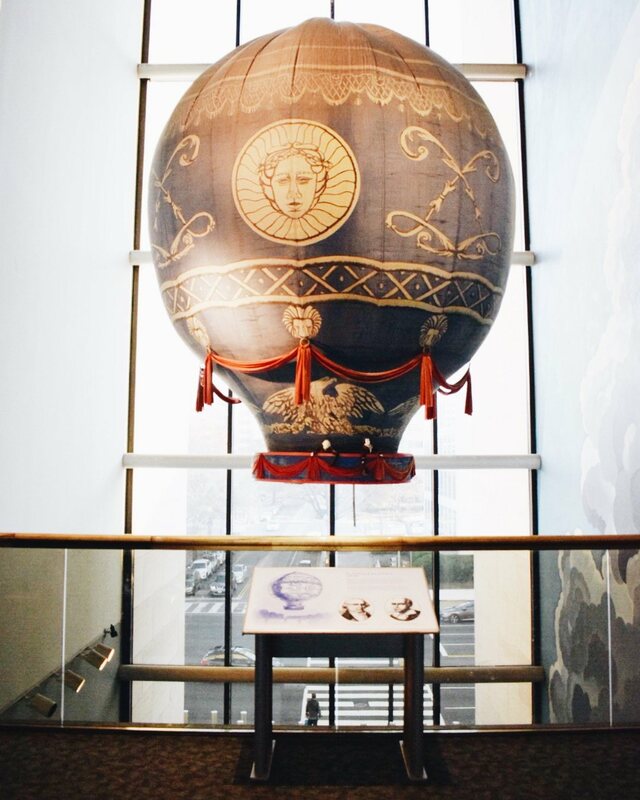 It really helped us to go through the exhibits thinking about someone specific. Toward the end of the exhibit, there is a wall with pictures of the tattoos that people had from the concentration camps, and there was a man who had posed for one of the pictures. It was an incredibly sobering experience to have thought about what all these people experienced, and then meet someone who actually lived through what we were learning about. Throughout this whole process, we walked through the Mall like two and a half times… It was a lot of walking. Our feet were so tired by the end of the trip! Time-wise, here is how the trip went: we booked the flight around 12:30pm, by 1:30pm we were driving to Vegas, and at 9:30pm we were on a flight to D.C.! We hit the ground at 4:00am on Sunday and took an Uber into the city. At 10:30pm that night, we were on a plane back to Vegas, then back in our car on the way home from Vegas at about 1:30am on Monday. We finally hit Provo again at 8am, and we were all in classes or working all day. We were all exhausted by Sunday morning, but we pushed through it and every moment was totally worth the exhaustion! 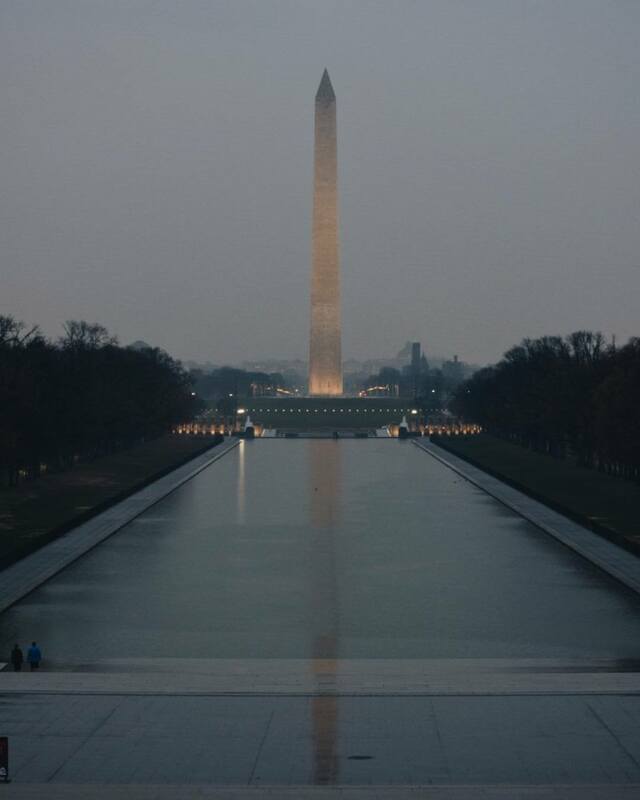 ^The Washington Monument at three different times during the day.